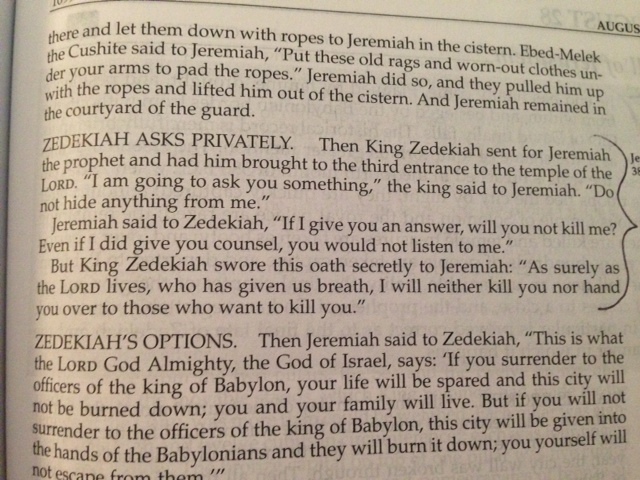 King Zedekiah knew about God and he obviously believed God had power. He searched for God’s direction. But then he still didn’t do what God told him to do. James described a double-minded man in the beginning of his letter in the New Testament. This man is like a wave, blown and tossed about by the wind. This man sounds just like King Zedekiah. Yes, there were big waves of conflict and deportation and death crashing around Zedekiah. He responded to this by constantly checking in with Jeremiah to see what God was saying. But then he went off and just did his own thing anyway. Does this sound familiar? Do we check in with God on Sundays and then go do our own thing the rest of the week? Do we ever have serious thoughts of obeying what we hear from God? Letting God change us? Transform us? Do we take significant action in order to get our faith solidly anchored on God, our Rock, so we’re not longer influenced and moved by the waves of our culture and the circumstances around us? God promised to help us become single-minded people who know the truth. All we have to do is ask. We need to seek him with all of our hearts, souls and strength. And we will find him. Because he is always there.